The Orthodox Church teaches that God created all things good, and that sin has invaded this good world with sickness and death. And part of the mission of the Church is to restore all things by the grace of God. This is why we have “holy water.” It is a setting apart of water as a kind of act of restoration. It’s mystically transforming water not into something magical, but it is restoring it to its Edenic dignity, and with this honor, it becomes another touch point of deeper communion with the Divine. We use it to bless ourselves, our homes, our cars, our pets, our food—virtually anything! Some people will take a sip of holy water first thing in the morning, others will put a small amount in their food when they cook. Others may take a small bottle while traveling to discretely sprinkle around while praying for the area and the people. It may be used generously. It is customary for clergy to set apart a sizable amount of water at Theophany (sometimes called Epiphany) in January, and the faithful will bring special containers to fill after the services. Many clergy will also bless a lake, river, or the ocean, and throw a cross in the water for the faithful (often children) to scramble after and retrieve. 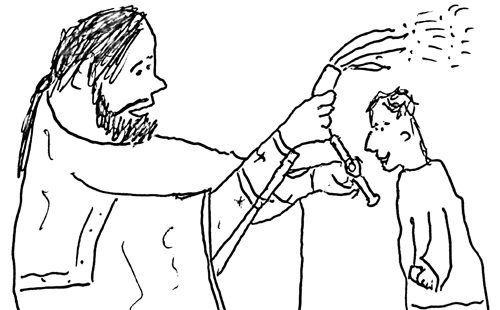 Some priests are very generous with the distribution of holy water and will use a large brush to fling droplets all over the faithful! Should you need to dispose of holy water, it should be used to bless things, you should drink it, or you may pour it into the ground. Fun fact: We do not need to set apart water from the Jordan River. By virtue of God being baptized in that water, we believe that is holy water forever. Many pilgrims will bring home holy water from the Jordan when they visit. What about you? Tell us about how you’ve seen holy water used by the Orthodox clergy and faithful, and if you think we’ve left something important out! This entry was posted in A to Z and tagged holidays, holywater, services, theophany by Jamey W. Bennett. Bookmark the permalink.